Straight from the pipeline blockade in the heart of unceded Wet'suwet'en territory. 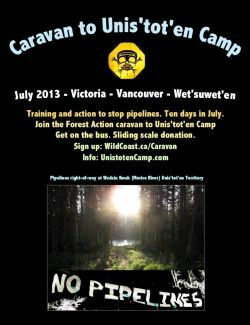 Find out how Forest Action Network set up and funded the caravan to support indigenous defenders. Be a part of this growing grassroots movement to stop pipelines and protect indigenous land. We're taking it to the next level. Hear about upcoming hikes, camping trips, mapping, research, legal support, and fundraising events. Bring a dish or a beverage and your hunger for justice. Contact zoe@wildcoast.ca or 250-813-3569 for the address and directions.